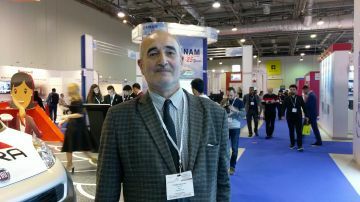 - I have been a regular visitor to Bakutel for many years now, and I feel quite comfortable to say that the quality of this exhibition is improving from year to year. Of course, this is largely the merit of the exhibition organisers. I want to emphasize that taking into account the peculiarities of the Azerbaijani market promising companies have been invited to the exhibition. Today the exhibition was favourably featuring new companies, trends, new products and the number of people interested in this field. It was pleasing to see Honeywell with the new facets of its brand. Since I am an educator at the Azerbaijan State University of Oil and Industry, I have brought my students to this exhibition; I should say that the exhibition is equally important for business people and the new generation. The exhibition helps learn about the most important aspects of this field and determine which projects will be in demand in the future so as to choose the right direction for both education and employment.